The Al Nusrah Front, an al Qaeda-linked jihadist group that is fighting in Syria, in October 2012 released two photographs of the execution of Syrian soldiers reportedly captured in Aleppo. One of the photographs is reproduced above. Needless to say, Assad ignored him. He was probably not surprised at Obama’s demand, given the unrelenting U.S. hostility to his regime, and that of his father, Hafez Assad, for several decades. This is due mainly to Syria’s close relationship with Iran and its support for Lebanon’s Hizbollah and Palestinian organizations including Hamas, and the deployment of Syrian troops in Lebanon to 2005. U.S. hostility to Syria (listed by the State Department as a sponsor of terrorism) reflects that of Israel, which illegally occupies Syria’s Golan Heights. The proximate reason for Obama’s call was that Assad had fired on his own people. One must question Obama’s authority to make that moral judgment, given that police in the U.S. fire on unarmed people, especially young black men, all the time (especially in Chicago, L.A. and Philadelphia); and that the U.S. arms security forces in countries including Egypt and Bahrain that fire on their people as well. Obama was simultaneously (from March 2011) accusing Libya’s Moammar Qaddafi of “attacking his people” and planning mass slaughter (a charge many analysts questioned, there being little evidence for it). It was just another Big Lie, comparable to the Big Lie that the Taliban was in bed with Osama bin Laden and complicit in 9-11. Or that Saddam Hussein was aligned with al-Qaeda and producing weapons of mass destruction. But it served as the pretext of U.S.-NATO intervention on behalf of armed rebels and their western-trained front men, who have plunged Libya into chaos and made it fertile ground for al-Qaeda-linked groups since the fall and murder of Qaddafi in October 2011. On the other hand, the Obama administration did not call on Hosni Mubarak of Egypt to step down even as his forces fired on the people, killing 850 in 2011. It delayed giving Mubarak his marching orders until February, when the mass upheaval had become so powerful, and the U.S. so despised for its complicity in repression, that it became impossible to extend the Egyptian dictator further support. And it has never called upon the Bahraini king to step down, even as he attacks his own people. Many people paying attention see some hypocrisy here. There are several reasons for this projected long duration. Assad’s forces are stronger than Obama expected and have scored some notable victories lately against the rebels. The opposition is divided into about 1,200 groups. The strongest rebel military force is the al-Qaeda faction, the Al-Nusra Front. If the U.S. and its allies want to strengthen and use the non-jihadi forces (whom they are aiding with weaponry, and who may or may not wish to create a western-friendly, non-Islamist “democracy”) they will have a lot of work to do since even the “moderates” seem to appreciate the superior fighting skills of the Islamist fighters. And Russia and China stand behind Assad, promising to veto any UN resolution such as the one used to legitimate the assault on Libya, ostensibly to “protect” its people. But it seems Obama and his Secretary of State John Kerry would like to do this a second time—that is, take a risk and place in power people they don’t know. One wonders what their real reasons might be. Surely Israel plays a major role in their reasoning, but Israel may be ambivalent about U.S. arms to rebels who might be as hostile to it as Assad. And Assad has in fact offered to recognize Israel following the return of the Golan Heights. Israel appreciates the fact that he has maintained peace along the border, even importing Golan-grown apples. His secular, religiously tolerant Baathist regime is preferable to an Islamist one. Surely a key U.S. goal is to weaken Iran, and the Syria-Iran-Hizbollah alliance. But if that goal were to be obtained through handing a central Arab state to al-Qaeda, would it be worth it? Al-Qaeda once seemed scattered, vitiated, defeated. But then the U.S. invaded Iraq, and al-Qaeda which had never been there before mushroomed overnight in Al-Anbar province, causing the occupation big headaches. Libyan jihadis flocked to Iraq, and returning home created a new Maghreb branch of al-Qaeda, which in turn spawned a Sahel branch now causing mischief in Mali. The majority of the al-Nusra fighters in Syria seem to be arriving from Iraq. Meanwhile U.S. missile strikes on Yemen build sympathy for Al-Qaeda on the Arabian Peninsula—totally counterproductive. The lesson is, U.S. imperialism (which once worked alongside bin Laden in Afghanistan; and which alienated bin Laden through its unlimited support for Israel, its support for hated Arab regimes, its sanctions on Iraq which killed half a million children, etc.) positively nurtures al-Qaeda and its affiliates. Even as the interminable terror war justifies the limitless expansion of the surveillance state, unprecedented prosecution and abuse of whistle-blowers and the continued practice of torture. The more the U.S. and its allies get involved in Syria, the more jihadis will likely get involved. Al-Qaeda has proven that it thrives on U.S. interventions. This is just one reason to demand the U.S. stay out of Syria. ASHEVILLE — Sampling of test wells surrounding two ash lagoons covering nearly 100 acres at Duke Energy’s Asheville power plant leaves no doubt that groundwater has been contaminated. Illegal discharges of toxic heavy metals also have been detected seeping from the ash-laden ponds into the nearby French Broad River. For environmentalists following the issue, those are reasons enough for state regulators to take immediate steps to address the pollution. That’s also why they are dismayed with a proposed settlement of a lawsuit against Duke by the N.C. Division of Water Quality. The consent decree announced last week calls for more testing of problems already well-documented and little in the way of stopping the contamination, said Hartwell Carson, French Broad Riverkeeper with the Asheville-based environmental group Western North Carolina Alliance. “It’s basically a way to drag this out as long as possible,” Carson said. “This is definitely a deal to study this almost indefinitely, when what we know is there are violations of the Clean Water Act and state groundwater standards. State officials contend that while the proposed settlement outlines a series of steps to assess the contamination at the Lake Julian plant and Duke’s Riverbend facility in Gaston County, it also requires the utility to develop plans for addressing the problem. North Carolina has 14 plants that burn coal to heat water, creating steam that turns turbines to produce electricity. About 10 percent of what is burned becomes ash — a black, powdery material that is sluiced into holding ponds. The Asheville plant has two ponds. One built in 1964 covers 45 acres, and the other constructed in 1982 is 46 acres. At spots, the ash is 60 feet deep, and together the lagoons can hold some 450 million gallons. The issue of coal ash grabbed the nation’s attention in 2008 when an ash pond at Kingston Power Plant in Tennessee ruptured, inundating homes downhill with some 1.1 billion gallons of toxic coal ash slurry. Despite the age of Duke’s coal ash ponds near the French Broad, the state first required groundwater testing three years ago. Those tests found levels of contamination well above state health standards with toxic heavy metals associated with coal ash. Carson also collected samples from seeps and springs flowing into the French Broad next to the plant that tested positive for many of the same toxic substances. Such unpermitted discharges violate the federal Clean Water Act. In addition, a study by the Duke University Nicholas School of the Environment released last year found that the facility discharges arsenic, selenium, cadmium and thallium in concentrations above U.S. Environmental Protection Agency standards. “There really is no question about the contamination,” said D.J. Gerken, an attorney with the Southern Environmental Law Center in Asheville. “We have no doubt there is enough confirmation of the contamination to require action. Frustrated by a lack movement on the state’s part, the law center, representing several environmental organizations, in January filed notice of intent to sue Duke Energy over violations of the Clean Water Act. That was followed in March with the filing of the state’s suit in Wake County Superior Court against the utility. In addition to groundwater contamination, the lawsuit claims inspectors discovered seeps of materials making their way into the river. The chemicals include thallium, a highly toxic element associated with nerve damage, along with boron, selenium, iron and magnesium. The proposed settlement includes a timeline of required actions to address violations or threatened violations of state statutes and rules for water quality protection. It also calls for an initial fine of $99,112. Failure to comply with provisions of the order also would subject the utility to fines of $1,000 per day for the first 30 days and $5,000 per day thereafter for each violation. Erin Culbert, spokeswoman for Duke Energy, said the utility has complied with the conditions of all its permits and that water quality in the French Broad is good. Gerken said the settlement is inadequate. The state already has the information it needs to force immediate action, he said. “The state submitted a sworn statement saying there is contamination, and instead of taking action they are looking to study what they already know,” he said. “There are no firm deadlines in this agreement. But Kritzer noted the lawsuit is the first in history filed by the state to address unpermitted discharges from coal ash ponds. Gerken said he believes the state filed its lawsuit as a means to circumvent the Southern Environmental Law Center from lodging a complaint with the court. Gerken said his organization has filed a motion with the court to make it a party to the case, and a judge has yet to rule. The public has until Aug. 14 to submit comments on the proposed settlement. EPA proposed regulating coal ash as a hazardous waste in 2010, but no action has been taken. Unprecedented mass lease cancellation occurs near homes of some of fractivism’s most effective mobilizers. Certain powerful images really stick with you when you watch Gasland or Gasland 2. First is the shot of the tap water on fire. Equally powerful are the images of the film’s director Josh Fox on his porch strumming his banjo, in the woods on his property, walking by the local stream, and celebrating the pristine beauty of the nearby Delaware River. The film keeps returning to the land that Fox treasures, cluing us in on why he turned down a sizeable offer to lease for gas drilling, and what drove him forth with his camera on a fact-finding journey that culminated in the first Gasland, the film that ignited the fractivism movement. 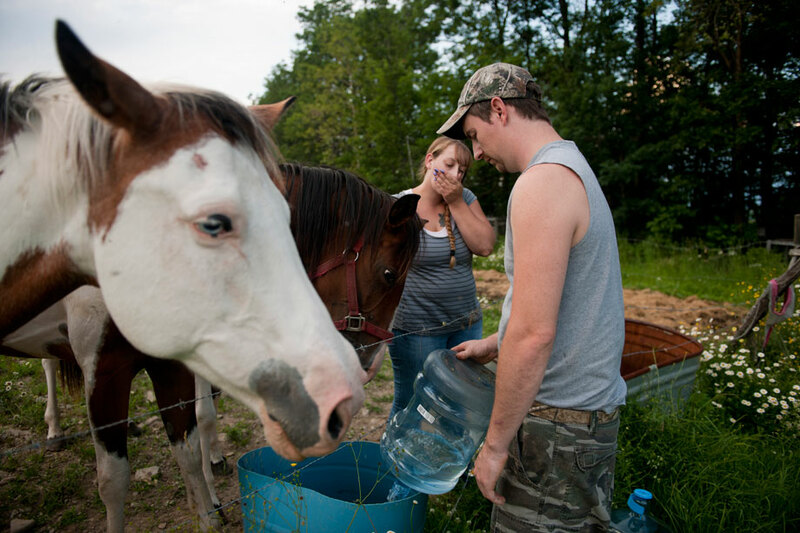 The offer on the table in Fox’s corner of Wayne County, PA was part of the first incursion of fracking into the Northeastern U.S. The arrival of landsmen— the gas company representatives offering quick and easy money with no downside if people signed away the mineral rights to their land, had already been going on in the Western U.S. As it plays out road by road, town by town, and state by state, fracking baldly reveals the downsides of the myth of American individualism. Americans prize the right to do what they want on their property. But other people’s rights wind up violated when what Neighbor A chooses to do contaminates the water supply, impinges on the quality of life, or destroys the property value of Neighbor B. And that cross point—one person’s rights to drill versus others’ rights to protect their homes, community and water supply is central to every community’s divide over fracking. It’s science’s job to assess benefits versus risks. It’s government’s job to mediate my rights versus yours. When science fails to study, when government fails to monitor, it’s neighbor against neighbor. When millions of dollars spent on ad buys and lobbyists assure that marketing slogans like “energy independence” appear everywhere from Superbowl commercials to State of the Union talking points, then local battles erupt in places like Wayne County. Since 2007, when leasing began in Wayne County, Fox’s once idyllic rural community has been embattled. And so is a nation divided at a crossroads of energy choice and climate change. But over the last few weeks, that changed for Wayne County. Hess and Newfield, the two major gas companies leasing land there, decided to cancel their leases in Marcellus shale, and move out of Wayne and much of northeastern PA. The companies sent letters stating that they “have elected to release your lease, thus your lease will not be continued to the development phase,” terminating approximately 1,500 leases covering over 100,000 acres of land. It’s no happenstance that the unprecedented mass lease cancellation occurred in a region that is home both to Josh Fox, fractivism’s heroic Pied Piper, and to the first fractivist organization founded in the Northeast U.S., Damascus Citizens for Sustainability (DCS)— making it a triumph both for Fox and for the dedicated grassroots effort by a community of neighbors that began in 2007. Fox was inspired to film his investigation of fracking’s impacts on average citizens in 2008 after attending a local public event hosted by DCS co-founders Joe Levine, Jane Cyphers and Barbara Arrindell. The first Gasland film is dedicated to them. When faced with the shared threat of fracking, this trio pooled their skills to organize. Levine is an architect conversant with land use, zoning, and local ordinances and officials; Cyphers is an educator; and Arrindell has a background in science, which made it easy for her to grasp the geological complexities beneath the marketing phrases. A small part of Ohio has secured the ignominious honor of becoming the most successful frackwater dumping ground in the state. Welcome to Portage County, Ohio, the biggest dumping ground for fracking waste in a state that is fast becoming the go-to destination for the byproducts of America’s latest energy boom. As fracking—pumping a briny solution of water, lubricants, anti-bacterial agents, and a cocktail of other chemicals into underground shale formations at high pressure to fracture the rock and extract trapped natural gas—has expanded in the Midwest, so has the need for disposing of used fracking fluid. That fracking waste can be recycled or processed at wastewater treatment facilities, much like sewage. But most of the waste—630 billion gallons, each year—goes back into the ground, pumped into disposal wells, which are then capped and sealed. A bunch of it ends up underneath Portage County. Nestled in the northeast corner of Ohio, about halfway between Cleveland and Youngstown, this 500-square-mile county pumped 2,358,371 million barrels—almost 75 million gallons—of fracking brine into 15 wells last year, driving enough liquid into the ground to fill a train of tanker cars that would stretch 37 miles. Most of the waste came from out of state. According to the Akron Beacon Journal, almost 58 percent of the waste injected into Ohio wells is trucked in—much of it from Pennsylvania and West Virginia. More than 200 disposal wells dot the state, which has looser regulations than its neighbors. The Columbus Dispatch recently reported that Ohio injected just over 14 million barrels of fracking waste into disposal wells in 2012, and more than 8 million came from other states—an uptick of 19 percent from 2011. And despite Republican Gov. John Kasich saying he’s not thrilled about the amount of waste crossing state lines, federal commerce protections prevent the state from barring legal substances from being shipped in. Because Ohio regulates its own disposal wells, the waiting period to get approval to drill a new well is about five weeks, compared to upwards of eight months in Pennsylvania, where the feds are in charge. That might explain why Ohio has more than 20 times as many wells as its neighbor. “People are concerned,” says Maureen Frederick, one of three county commissioners for Portage, “and rightly so.” According to Frederick, the county not only has no say over the wells, but it also doesn’t see so much as a cent of the revenue collected. Well permits cost $1,000, and the state charges $0.20 per barrel for out-of-state waste and $0.05 for in-state waste, meaning the state collected roughly $2 million for the 14 million barrels of frackwater that were pumped into the ground in 2012. Portage, which is home to Kent State University, was mostly a farming community 25 years ago, and it has benefited from the growth of ancillary industries that come with fracking. But Frederick, who lives less than a mile from a disposal site, said she wasn’t aware of any economic boon that has followed the injection wells. Local realtors, on the other hand, were “observing the difficulty of people wanting to buy property, and those looking to sell being worried about their property values,” as residents’ concerns about groundwater contamination and earthquakes have grown. There are good reasons to worry. The dozen earthquakes that rattled Youngstown at the end of 2011 were thought at the time to have been caused by fracking. A new study connecting underground injection to earthquakes seems to confirm those suspicions, and there is growing evidence that the practice is linked to methane leaking into water supplies. (See the GIF below for more.) There are problems with the wells used to store the used fracking brine, too. The wells that this waste is pumped into—called Class II disposal wells—are subject to softer regulations than other disposal wells (there are six classes in all). The EPA estimates that the chance of a given injection well failing is around 1 in a million. But 680,000 injection wells—some 170,000 of them Class II—dot the country, containing about 30 trillion gallons of toxic liquid. Many of the wells in Ohio are repurposed oil and gas wells that are grandfathered in and exempt from current standards, and government regulators raised concerns about disposal wells contaminating groundwater as far back as the 1980s. At the time, the EPA knew of 23 cases nationwide where drinking water was contaminated by Class II wells. But a recent ProPublica investigation found another 25 cases of alleged contamination from Class II wells between 2008 and 2011 alone. In 1989, the Government Accountability Office, then called the General Accounting Office, filed a report that “says that we have some problems with Class II wells,” says Briana Mordick, a staff scientist with the Natural Resources Defense Council. “They actually wrote up proposed improvements to the regulations, but those regulations have never been updated.” Even perfectly sounds wells have leaked after waste was injected at higher pressure than the rock formations holding it could bear. In southern Ohio, waste from one well migrated up through 1,400 feet of rock. The injection-well boom has led to rising community tensions. At an open house back in May, a mostly middle-aged crowd of about 50 people, many of them academics at Kent State, were surprised to be met with 14 armed Ohio Department of Natural Resources police officers and a police dog, according to the Portage County Record-Courier. An ODNR spokesman told the local paper that the show of force was in response to an earlier problem with protesters, but an octogenarian who attended the meeting told the Record-Courier he’d “never been to a public meeting so oversupplied with armed people.” There have also been recent problems with disposal. In February, Ben Lupo, who owns D&L Energy, an energy production and marketing company based in Youngstown, was indicted on charges of ordering more than 20,000 gallons of brine into the Mahoning River. The company had racked up 120 violations, but didn’t suffer serious consequences until an anonymous tip exposed the illegal dumping. Two of the three members of the Portage County Commission have voiced their support for a recent bill that would ban injection wells, but even the bill’s sponsor doesn’t think it will get traction in the GOP-controlled state House of Representatives. “I abhor having the distinction of being the injection well capital of Ohio,” Frederick says. But there’s not much she can do about it. Thomas Stackpole is an editorial fellow in Mother Jones’ Washington, DC, bureau. He has also written for The New Republic and MSN News. Email him tips at tstackpole [at] motherjones [dot] com. You can follow him @tom_stackpole. Jodie Simons demonstrates how her sink water, full of methane, lights on fire. Simons’ household’s water was pristine before gas drilling started, but now they’ve been without clean drinking or bathing water for months. Photographer Nina Berman had just started focusing on climate and environmental issues when she read an article about fracking and its connection to the possible contamination of New York City’s drinking water. Berman resides in New York and knew very little about how the controversial process of drilling for natural gas via hydraulic fracturing worked and decided to head to Pennsylvania for Gov. Thomas Corbett’s inauguration in 2011. “I knew there would be demonstrators (opposed to his support of natural gas drilling), and I wanted to learn what they were screaming about,” Berman said. After researching the issues, she then had to figure out how to document them in a visual way. Fracking’s health impact, specifically its impact on water, is one of many controversies surrounding the process of drilling into rock in order to release gas. While some argue it is an alternative to dependence on oil, the methods of drilling involving water, sand, and chemicals to break up the rock has also been argued as the culprit for contaminated water. “Those of us who are used to clean water have no concept of what that feels like when your water coming from your well on your land is destroyed and you can’t do anything about it,” Berman said. Part of the way Berman is sharing her experience is through the “Marcellus Shale Documentary Project.” Started in November 2011, Berman and five other photographers documented how communities in the Pennsylvania Marcellus Shale region have been affected by natural gas drilling. With a nod to the Farm Security Administration’s program assigning photographers to document communities during the Great Depression or the Documerica project during the 1970s that looked at how environmental concerns were impacting Americans, the “Marcellus Shale Documentary Project” focused on the impact of fracking on the lives of Pennsylvanians. The exhibition is currently on view at the Center for Photography at Woodstock in New York through Aug. 18. Berman said for now she has done as much as possible in Pennsylvania but would be interested in documenting areas around the country that have also been affected by fracking. Until then, she has been exhibiting and touring with the “Marcellus Shale Documentary Project” and feels the impact has been positive. “That is how I like to work in many ways, to be a part of bigger things,” she said.